Optometrists say that Nintendo's 3DS won't damage developing eyesight - and in fact, it might do just the opposite. Nintendo has been warning parents since the 3DS' official debut that the 3D-capable handheld might not be suited for young children, as the parallax barrier could damage or strain developing eyesight. While the American Optometric Association said that it should be a-OK for kids to use the system, Nintendo stuck to its word. However, the AOA thinks that there may be a very good reason for children to play the 3DS: It could help identify potential vision disorders at an age where they're still correctable. According to AOA associate director for health sciences and policy Michael Duenas, the 3DS could be a "godsend" for aiding optometrists in diagnosing problems such as amblyopia ("lazy eye") in children, reports the AP. While sending stereoscopic images to produce a 3D effect generally works well, it's completely artificial - and lacks the more subtle cues we see in real life: Maybe light doesn't glint off the edges of an object as it should, or maybe it doesn't interact with the environment just as we expect it to. Many people can automatically correct for this, but it's what causes eye strain and headaches - and some people with a vision disorder can't see it at all. The good news is that these disorders are easily treated, as long as it is identified before age 6 - when our visual system is roughly finished developing. The bad news is that fewer than 15% of preschoolers ever have the sort of comprehensive eye exam that could catch the vision issue in time. Enter the 3DS. The AOA thinks that if a young child cannot see the 3D effect no matter how you tune the slider, it might be a cue to take him or her in for an eye exam. 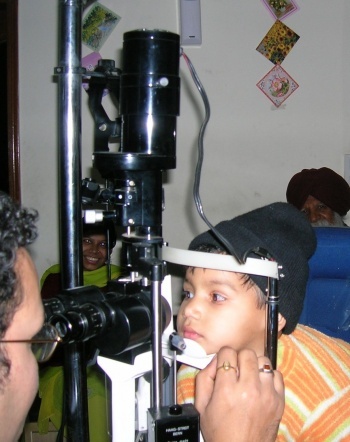 Because many more children will likely have access to a handheld game console than will get a comprehensive eye checkup, this means that more problems could be identified than might have been otherwise. "[The 3DS] has presented my profession, optometry, a wonderful opportunity," said AOA president Joe Ellis. But not all eye doctors are in agreement. David Hunter, an ophthalmologist at the Children's Hospital in Boston is skeptical that the 3DS could aid in identifying vision disorders. Those who suffer from amblyopia don't have much depth perception in their day-to-day life, he said, so they might not see anything different in the 3DS. While he didn't rule out the possibility, Hunter said that it was "all sort of exploration and speculation." That hasn't stopped the AOA and the 3DAtHome Consortium - a group of technology manufacturers and Hollywood studios - from joining forces and pledging to share information about how 3D affects eyesight, a topic on which little long-term research has been done. Of course, Jim Sheedy, director of the Vision Performance Institute said that parents should be prudent about how much time their children spend playing videogames anyway. The #1 health concern associated with gaming is not eyesight issues but rather obesity, he said. "Kids should be out running around."